Enclosed within the Atlas 5’s metallic 13.8-foot (4.2-meter) diameter shroud, the InSight spacecraft was transferred from an Astrotech payload processing facility to Space Launch Complex 3-East at Vandenberg early Monday. A crane lifted the probe top the Atlas 5 rocket protected inside the launch pad’s mobile gantry, and technicians mated the payload on top of the Atlas 5’s Centaur upper stage. 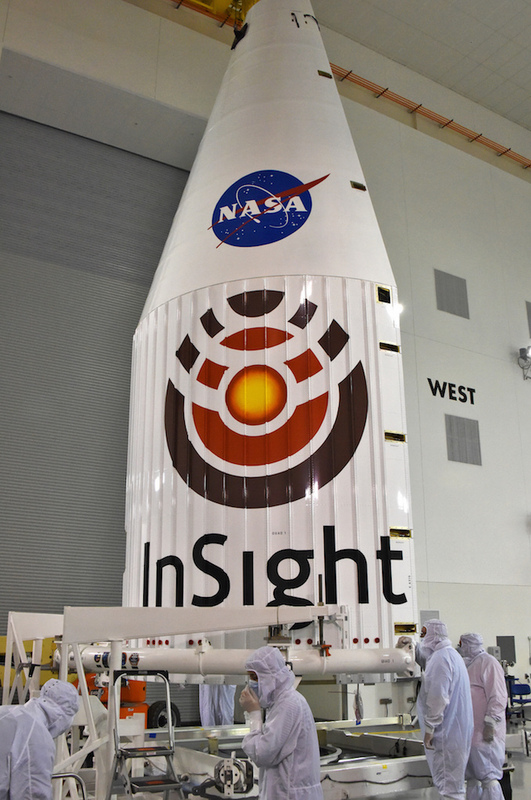 With the addition of InSight and its aerodynamic enclosure, the Atlas 5 rocket stands 188 feet (57 meters) tall. 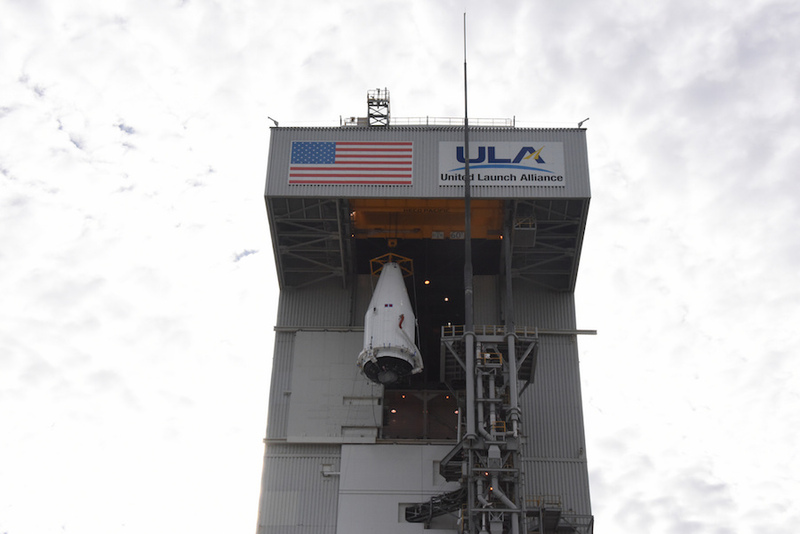 No photos of payload lift operation were released by NASA or ULA as of Tuesday afternoon. The final assembly of the Atlas 5 rocket is one of the last major steps before launch. Engineers will check electrical connections between the launcher and its payload in a series of tests over the next few days, setting up for final readiness reviews next week and the start of countdown preparations the evening of Friday, May 4, with the retraction of the mobile service tower at the SLC-3E launch pad. InSight has a two-hour launch predawn window May 5 opening at 4:05 a.m. PDT (7:05 a.m. EDT; 1105 GMT). 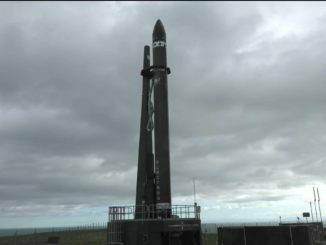 The nearly $1 billion mission, funded primarily by NASA with contributions from France and Germany, has until June 8 to launch from Vandenberg, when the ever-changing positions of Earth and Mars in the solar system make a direct trip possible. Mars launch opportunities come once every 26 months. The lander will arrive at Mars on Nov. 26, regardless of the launch date from May 5 through June 8. InSight will be the first mission to another planet to launch from Vandenberg, a military base on the Pacific coast between Los Angeles and San Francisco. 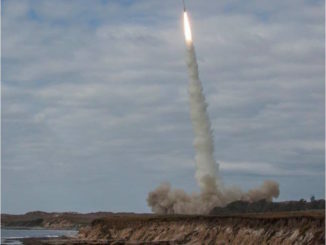 Vandenberg Air Force Base is typically host to launches into polar orbit, a type of orbit usually tailored for climate research missions, spy satellites and some communication applications. NASA’s interplanetary probes are usually reserved for launches from Cape Canaveral, where rockets take off toward the east over the Atlantic Ocean for safety reasons. 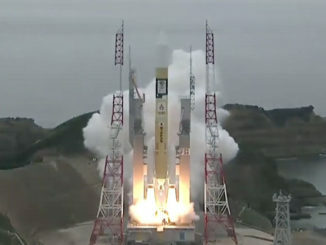 A launch toward the east gains an extra boost from the speed of Earth’s rotation, allowing a rocket to carry a heavier payload. But InSight is small — it will weigh around 1,530 pounds (694 kilograms) at launch — well below the lift capability of the United Launch Alliance Atlas 5 rocket, which will fly in its basic “401” configuration with a four-meter payload fairing and no solid rocket boosters. That means the Atlas 5 will not need the extra energy imparted during an eastward launch from Cape Canaveral, and ULA and NASA agreed to launch InSight from Vandenberg. Fewer Atlas 5 missions are scheduled from Vandenberg, so officials wanted to reduce the workload at ULA’s busier launch base in Florida. The 4th Space Launch Squadron provides support for ULA’s Atlas and Delta rocket missions at Vandenberg, a launch manifest that is primarily comprised of secret spy satellites for the U.S. government. 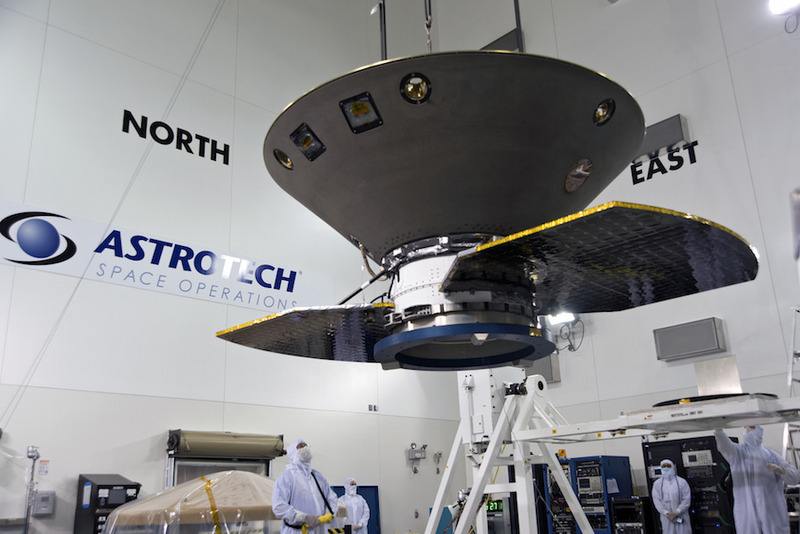 Designers based the InSight lander on NASA’s Phoenix probe, which launched in August 2007 and touched down on the northern polar plains of Mars in May 2008. Diminishing solar power and cold temperatures limited Phoenix’s lifetime to about five months — two months longer than its three-month prime mission. A robotic arm on InSight will place a French-built seismometer on the surface of Mars near the lander, and a heat probe provided by the German space agency, DLR, will burrow up to 16 feet (5 meters) underground to measure thermal energy coming from the red planet’s interior. Scientists will collect the seismic and thermal data to find out about the structure of Mars’s crust, mantle and core. The information will help geologists understand how rocky planets like Mars, and Earth, formed in the early solar system. The geologic record dating back to the birth of the planets some 4.5 billion years ago has been erased on Earth. 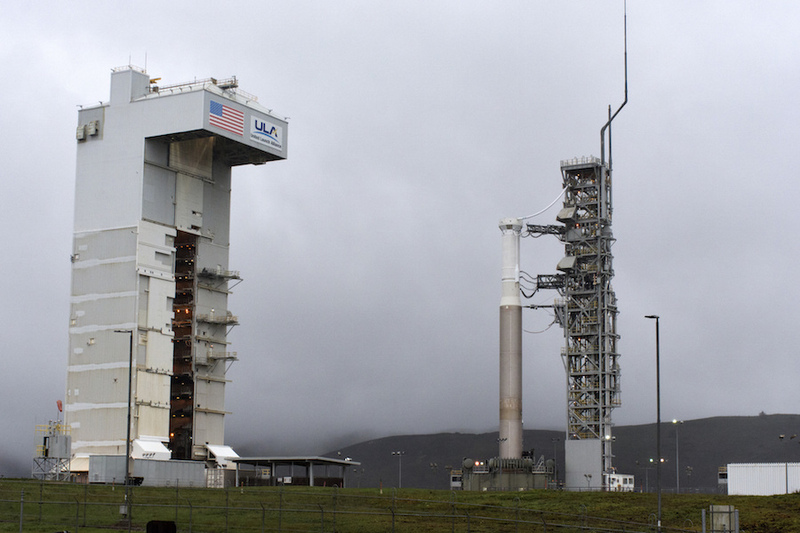 ULA’s launch team at Vandenberg began assembling the Atlas 5 rocket on its launch pad at Vandenberg on March 3 with the stacking of the kerosene-fueled first stage booster. Two days later, on March 8, a boattail structure was added to the top of the Centaur stage. The boattail provides an aerodynamic and structural connection between the Centaur and the Atlas 5’s payload fairing. A pair of CubeSats that will accompany InSight to Mars were installed on their carrier aboard the Centaur upper stage last month. The CubeSats will fly by Mars and attempt to beam telemetry from InSight back to Earth during the lander’s descent. The launch team completed a countdown rehearsal March 22, during which the Atlas 5 was loaded with liquid propellants to simulate launch day procedures. The “wet dress rehearsal” is not part of a typical Atlas 5 launch campaign, but managers added the test to wring out any potential problems with the rocket well ahead of liftoff due to InSight’s tight interplanetary launch period.